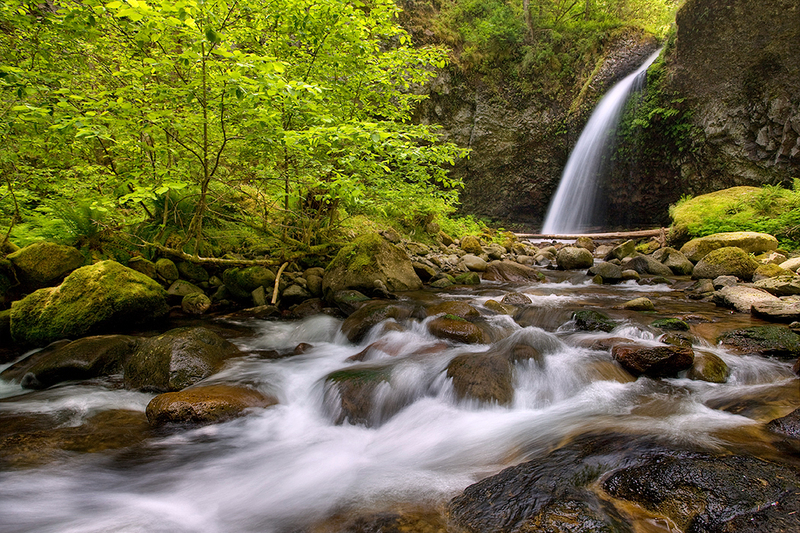 The scenic Columbia River Gorge is punctuated with lush, pristine canyons, formed over thousands of years by the annual snow melt run-off flowing from nearby Mt. Hood. Oneonta Creek, in particular, has carved its own canyon through the rugged, often primitive hillside. In many places, the landscape is extremely abrupt, forcing water over the edges to create amazing waterfalls. There are four spectacular waterfalls along Oneonta Creek. This photograph shares how the light plays with the fresh spring moss and foliage, while it elegantly frames the rushing riverbed. The camera's eye focuses on the life of one of Oneonta's falls, capturing the energy of the rushing water as it continues on its journey down the Columbia river to the sea.